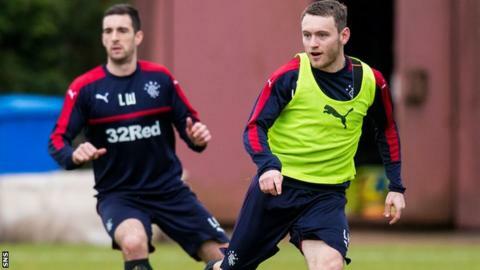 Lee Hodson reckons this week is crucial as Rangers attempt to overtake Aberdeen and finish second in the Premiership. The Ibrox outfit trail Aberdeen by eight points ahead of the Dons' trip to Dundee on Friday and Rangers' home fixture against Motherwell on Saturday. "This week is massive, first we have Motherwell, then we've got Wednesday's game at Kilmarnock," Hodson said. "If we can get six points there, going into the game with Aberdeen on Sunday, it'd put them under a lot of pressure." Third-place Rangers make the trip to Pittodrie a week on Sunday and the two sides will meet once more before the end of the campaign. Saturday's match against Well is new manager Pedro Caixinha's second in charge, with the Portuguese having guided Rangers to a 4-0 win over Hamilton in his first match as boss. And Hodson insists positive thinking has a part to play as Rangers try to reel in Aberdeen. "We've got to believe we can catch them," the defender said. "In the last three games we've shown some real positive signs that we can push forward to where we want to be. "If you go into games thinking you're not going to win, that's not right. You need to have that winning mentality. "There's a new manager in now and that's given the players a lift. That showed against Hamilton in his first game in charge. We put in a real strong performance." Hodson looks set to start against Well, with fellow right-back James Tavernier suspended, and the Northern Irishman hopes to put a marker down. "When a new manager comes in, every player is being looked at," the 25-year-old said. "It's up to you as a player to try and catch the manager's eye and impress him so you are the one who plays come Saturday. "We're still only three weeks in and everyone is playing for their places. Hopefully if I carry on training well I'll get more game time. "That's down to the manager, though, and we'll have to see how things go in the next couple of weeks."